Less than 20 minutes from Phoenix Sky Harbor Airport heading east are three attractions well worth seeing when you’re visiting in the Phoenix area. Bring your camera, because you will want to record your views – they are unique! All are around the area called Papago Park. 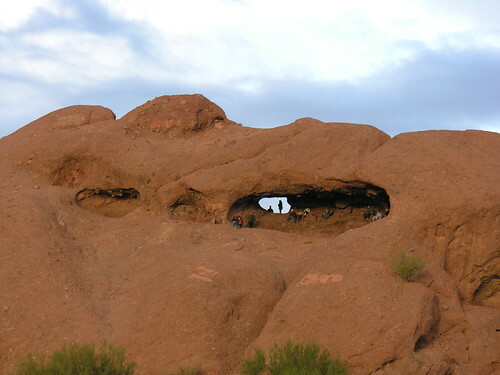 An actual park, Papago Park has ramadas (covered picnic areas) and a rock formation that visitors can climb. It is that rare stone in which nature has carved a window, called “Hole-in-the-Rock.” Climb up from a path leading behind the opening and get a great view! It is not a handicapped accessible visit – at least not the entire pathway. Other activities include hiking trails, fishing (license required), and archery. In warm weather, you will want to bring water and a hat and arrive early in the day. This time of year, the weather is perfect to take the several minute walk to the “window,” then go back and have a picnic lunch. Next, you will want to visit the Phoenix Zoo. Until January 10, Phoenix Zoo has their “ZooLights” program running every evening from 6-10 P.M. Thousands of lights and special exhibits make this a memorable event with the “Land of the Dragon” theme entrancing children of all ages. Admission is $10 for a ticket good any day of the week; there are $9 tickets fro Sunday through Thursday nights. 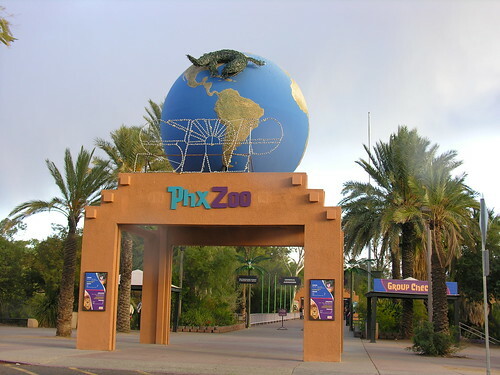 There’s a lot to do at the Phoenix Zoo! So, allow several hours. If you get hungry, they have several on premises food opportunities with pizza, burgers and the like. There are handicapped accessible paths, but there is a lot of walking. Both strollers and wheelchairs may be rented during your visit. Entrance to Desert Botanical Garden with 3 Chihuly "agave"
If desert plants are new to you, a trip (in the vicinity of the zoo) to the Desert Botanical Garden will amaze and delight you. 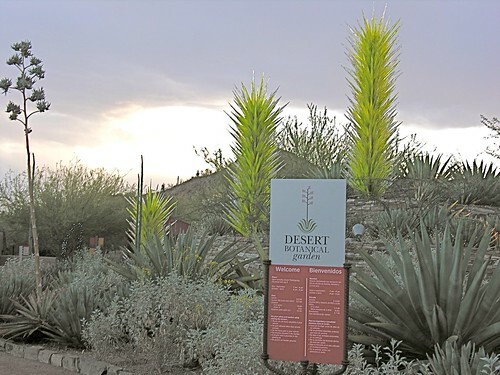 Set out in a park-like area, DBG has some unusual desert plants, a butterfly garden, endangered plants and some wonderful paths to stroll to see the plants. This time of year, (until December 30), Las Noches de las Luminarias lights up the walkways with thousands of small candles, a shimmering, glowing experience. DBG has numerous events to see a new aspect of the gardens. Food is also available on the premises. Again, allow at least two hours to see the many areas of the park. More next week as we take you to other great places to see, things to do and places to shop in Phoenix and nearby locations in Arizona. This entry was posted on Friday, December 4th, 2009 at 6:00 am	and is filed under Arizona, Family Fun, Food, Hiking, Scenery, Southwest, Travel, Zoo. You can follow any responses to this entry through the RSS 2.0 feed. You can leave a response, or trackback from your own site. Great post, thankyou for spending your time to post it.